SQL Server profiler displays data about a large number of SQL Server events. Whereas Windows System Monitor graphically displays information about the server internals. You can merge the two sets of information and walk through a scenario viewing both perspectives using SQL Server Profiler. Configure System Monitor with the exact counters you want to view later. Be sure to get the scale and everything just right. Set up the Counter Log to the exact same configuration. 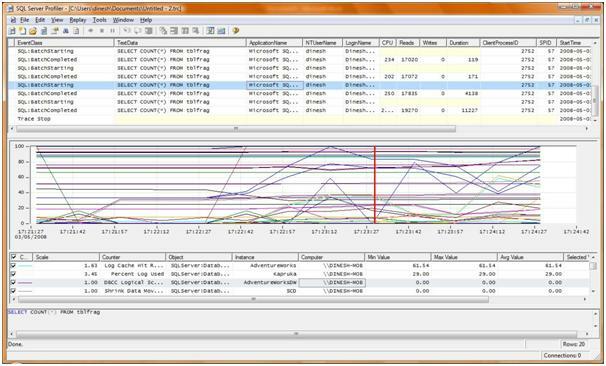 Configure Profiler with the right set of trace events. They must include the start and end time data columns so that Profiler can integrate the two logs later. Save the profiler and close profiler. Manually start the Counter Log. Open SQL Profiler trace code to start the server-side trace. When the test is complete, stop both the counter Log and the server side trace. You need to stop the SQL Profiler which is a negative point in this. Open profiler and open the saved trace file. Use the File->Import Performance Data menu command to import the Counter Log. You have the option of selecting only the important counters from the performance monitor. There will be performance issues if you select too many counters.